As if Japanese arcades didn't have enough hassles on their plate already. For Japanese arcades, offering up new and exciting ways of entertainment that people can't experience at home has always been the main focus. However, with the technological advancement of home consoles and the smartphone gaming bubble still going strong, this is becoming harder and harder to do. Who would have thought it would be Japan's own government, and not another entertainment industry, that would inadvertently step in to hammer the nail into the coffin. Japan is getting a sales tax increase next month from the standard 5% to 8%, Japan's Mainichi news reports. Basically, what cost ¥105 (US$ 1.03) up until now, come April is going to cost ¥108 (US$ 1.06). Doesn't seem like much, but it's causing a lot of headaches, especially for an industry that is already struggling as it is. Generally, video games are played in increments of ¥100 (US$ 0.98) for ease of use. That means, unlike stores that will simply have to increase the price of their goods, arcades can't make people pay smaller increments, and instead will have to either shoulder the increased tax themselves, or find another way to make ends meet in a steadily shrinking market. One method is to increase the difficulty on prize games, like the crane arm games – as if those things weren't $%&#ing impossible to begin with. Another would be to increase the number of games that use tokens, like slot machines. Either way, the negative impact seems unavoidable. That, coupled with the fact that people will likely be more careful with their money, does not bode well for the industry. 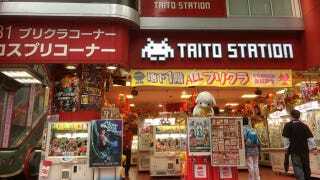 Japan is a place where people still regularly go to video arcades. While they may not seem important to those of us who enjoy our video games on console or PC, remember, a lot of the game genres we love were born out of the arcade's attempt to offer something that couldn't be experienced at home at the time. The innovation in different methods of entertainment has kept them alive this long. It would be unfortunate to see them go, not because something better came along, but because the tax increase meant they couldn't make ends meet.